Packed full of Vitamin C and antioxidants, this tea contains vanilla bean and sweet vanilla flavoured treats amongst freeze-dried blackcurrants, strawberries, elderberries, blackberries & hibiscus blossoms. Delicious hot or chilled. Get your antioxidants and Vitamin C through these magnificent fruits this season. 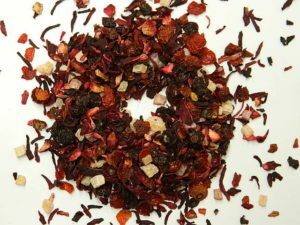 This fruity, delicious brew is a perfect treat hot for a winter’s night, and would make an amazing iced tea. It’s much sweeter and stronger than most store-bought fruit teas. I like to mix it with some lemon simple syrup to soothe a sore throat!